FLY ROD INNOVATIONS are like the weather; some years it’s all light showers and pretty flowers, and other years a hurricane blows in. This year you can taste the salt in the air. For 2010, the manufacturers are offering up a slate of big sticks for big fish. Saltwater single-hand casters are probably going to get the most out of the new product offerings, while the switch/Spey market also continues to expand rapidly. But across the board, manufacturers seem to be committed to smart improvements in product lines, producing rods that perform better than the previous generations and at lower or equal cost. G. Loomis thought carefully about the growing market for European nymphing rods this year and as a result is launching a super-sensitive 10-foot rod series. The Max Czech Nymph GLX series is offered in 3-weight and 4-weight models ($650 and $660). These are extra-stiff rods, sporting GLX graphite, for special high stick nymphing situations. We were impressed with how extremely light and responsive these new GLX tapers were, and they will no doubt please serious nymph fishermen. Hardy’s European partner Greys was one of the few companies to introduce more than one new line of rods this year. 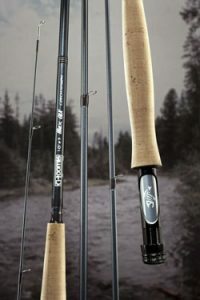 Greys introduced the GRI+ series, which retails for $129 – $299 and includes three double-handed rods; the G2 series, which retail for between $99 and $249 and include four double-handed rods, and finally the GS rods, which retail for $89 – $115. Meanwhile Hardy itself is hoping for a mid-year (April 2010) introduction of new Saltwater series of fly rods designed with the help of Andy Mill. Mystic is a brand new rod company begun this year by Michigan natives Dennis Klein and Chris Reister, who decided they weren’t finding the right combination of technology and performance in available mid-range rods. We tested the Tremor SW series, a medium-fast saltwater lineup with excellent components and finish (in blue, like many saltwater rods these days). The Tremor SW is available in line weights 8 through 10, with 9-foot, 3-inch blanks (to lift backcasts a tick further from the front of a flats boat). The new Mystic series ($479-499) looks to be a nice new entry in what has become a rather deep mid-price category. Orvis had a nice surprise ready for fly fishers this fall: a lower-priced version of the thermoplastics-based Helios rod called the Hydros. At least one of the Midcurrentstaff admits that the Helios has become his go-to stick for everything but very small rods. The new Hydros — deep sea blue rods with silver hardware — feature the same blank designs and technology as the Helios, but with less-expensive components and a few minor features (like painted male ferrule ends) left off. The absence of painted ferrules actually helps the rod pieces seat better, while the biggest change in components — regular instead of RECoil bounce-back guides — may actually make the Hydros rods a tick stiffer (and potentially longer-casting) than the Helios. The Hydros series will cover the exact same range as the Helios (i.e. 4-weight through 12-weight), excepting the two hand rods. Hydros rods will go on sale in the middle of October. L.L. Bean also introduced a new high-end line (high-end for Bean, that is; they tend to focus on the affordable end of the market). The new Silver Ghost series runs from 4-weight ($300) to 12-weight ($380). All are 9 feet long and come in four pieces for travel. We threw the 9-foot 5-weight and found it to be an absolute dart-chucker; a very accurate rod at thirty feet that generated tight, fast little loops. Sage‘s new Xi3 ($695-795) is their updated fast-action saltwater stick. Sage has continued the Xi-series tradition of a blue blank with black wraps and black hardware. According to Sage designer Jerry Siem, the rods have stiffer mid-sections than the older Xi2s while being lighter throughout, with the goal of reducing angler fatigue. We test-casted the 9-foot 8-weight and 10-weight Xi3s and think both are near the top of their class. Sage’s hardware and wrapping, as always, are impeccable. Meanwhile, Sage also introduced a new lineup of nymphing rods, the 99 Series, which are all 9 feet, 9 inches long. While our test-casters struggled a bit in casting them long distances, they loved them for what they’re designed to do well: high-stick nymphing combined with snake-roll pickups and position casts. It’s been apparent for a few years now that Redington, the budget-conscious little brother of Sage, benefits from the design research of its sibling. While Redington’s products are certainly cheaper, in many instances they are practically the equivalent of the high-end products. 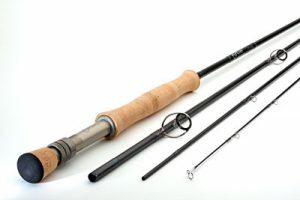 Redington’s new CT rod series is available in sizes from a 7-foot, 6-inch 2-weight up through a 9-foot 6-weight ($160). All the rods are 4 pieces except a special 6-piece 9-foot 5-weight and an 8-foot 3-weight ($180). We threw the 6-piece 5-weight and really liked it; it’s a flexible, laid back fisherman’s rod, and all those ferrules give it enough stiffness for oomphing out some long casts. This would be a great travel rod to stick in an overhead-carry on; that’s exactly what Redington intends in selling a bundled CT kit with reel and line. It’s always good to see younger bamboo rod makers pushing the limits at the FFR show, and this year Matt Schliske seemed eager for the challenge. The members of Schliske’s team (none of whom would object to being addressed as “Dude”) build from-scratch hardware, wraps and even reels. Schliske himself designs the blanks, which are excellent performers and compete favorably with a lot of fast-action graphite rods. In fact, UnderArmor model and renowned caster Rick Hartman succeeded in putting a cast from one of Schliske’s bamboo rods out the back of the 95-foot casting pool. St. Croix went back to its roots for 2010, with a re-designed budget rod, now deemed the Rio Santo. One MidCurrent reviewer is a huge fan of the superannuated Pro Graphite, the original in this lineage of rods. But the Rio Santo, like every St. Croix rod since the Legend Elite was released, benefits from huge advancements in St. Croix’s blank-building technique. Test casters found it smooth and powerful, with very upgraded hardware. This is a clear best buy in the $100-$130 price range, available from an 8-foot 4-weight through a 9-foot 8-weight. For Imperial series fans, St. Croix is also coming out with a new switch rod in four sizes and three new 10-foot rods (6, 7 and 8-weight). Five new models ($220-$300) in their popular line of Avid Series salmon and steelhead rods, a new Avid Pearl series for women ($160-$190), a couple of new Mojo Bass models and new Mojo Surf series rods ($140-$280) round out their offering. Finally, TFO finishes out the single-hand rod category with three new entries. TheClouser series of 8-foot, 9-inch rods are available from 5-weight through 9-weight sizes for $249. This is a redesigned blank based loosely on the Teeny rods TFO announced two years ago. Our test casters found them to be powerful, but especially nice for roll casting big bugs in close. We expect that these rods would pair nicely with Rio’s Clouser line, which has been on market for a few years. TFO also introduced the Mini Mag series, splitting out what had been a special fiberglass reinforced series of bluewater rods. Now available in an 8-foot 6/8-weight and an 8-foot 8/10-weight for $200, these rods would be best paired with a single-hand Skagit line or an integrated shooting head for bank-bashing in bass ponds or for white bass or stripers. Finally, TFO announced the Bug Launcher series of kids’ rods; these red-blanked sticks are available as a 7-foot 4/5-weight and an 8-foot 5/6-weight for $79. While they may be aimed at kids, our casters all felt this would be a nice backup rod for traveling anglers looking at warmwater action. Spey casting generally, and the hybrid of Spey and single-handed rods known as “Switch rods,” have been all the rage over the past five years. Clearly the market for these rods is still growing, because the manufacturers keep coming out with more models. Echo Fly Rods has a real winner in the true Spey category with the Solo 2Hand, a budget-conscious offering meant to get new anglers into Spey casting. These rods, available from a 12-foot, 6-inch 6-weight through a 13-foot 8-weight, cost only $229 — a very low price for a Spey rod. And they cast really well; our test casters particularly liked the 13-foot 8-weight for snake rolls and switch casts, favoring the Solo 2Hand’s laid back pace and deep blank bend. Meanwhile, Echo also updated its switch rods with the new Shadow PE (named for switch casting guru Pete Erickson), available for $329 in a 10-foot, 6-inch 3-weight and an 11-foot 4-weight. These rods should be very popular with Czech nymphers working tight water where limited backcast room forces Spey casting. Enjoying extraordinary growth in Europe this past year, G. Loomis put renewed focus on the two-hand category, with two new rods coming out for 2010. Loomis added to the true Spey category with two new rods, one high-end and one middle-range. TheStinger GLX rods are fast-action sticks for throwing heavy flies or lines in Scandinavian or Skagit-style casting. They are specified only in grain weights, from a 12-foot, 6-inch for 450-grain lines ($850) up to a 15-foot, 1-inch rod for 700-grain lines ($975). For more budget-aware anglers, Loomis also announced the VersaSpey Two-Hand, which range from a 12-foot, 6-inch 5-weight/6-weight ($550) through to a 13-foot, 6-inch 9-weight/10-weight ($625). Finally, Scott Fly Rods announced the Fiber Hammer, a 10-foot, 7-weight fiberglass switch rod ($625), which is either the coolest rod ever built or the most unhandlable live wire you ever twitched. We suspect it will have a cult following among skilled Spey casters soon (but this rod would definitely not be recommended for beginners).